Experience true rustic luxury at the best location on Lake Blue Ridge. Incredible lake and mountain views are combined with the beauty of a newly-built and tastefully decorated rustic home that will please the most meticulous vacationer. 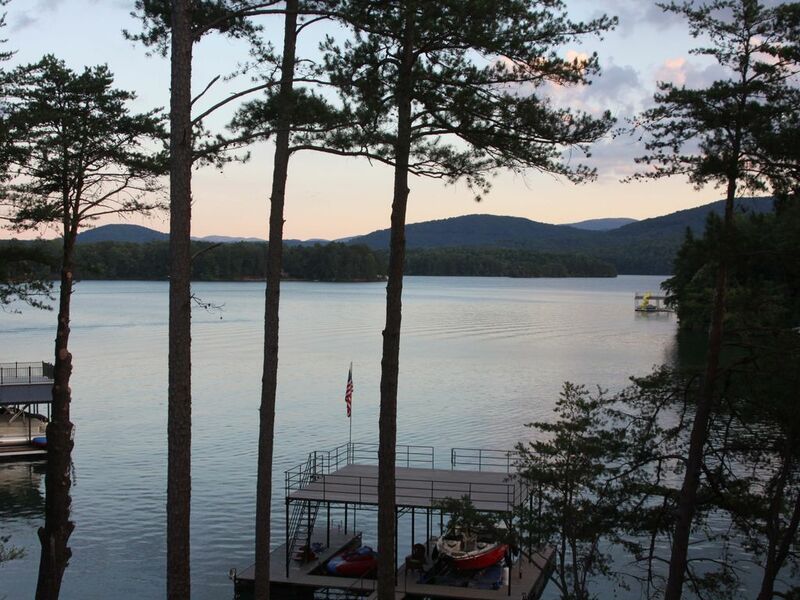 This home is only 5 miles from downtown Blue Ridge and sits on the western shoreline of the main body of the lake. Beautiful lake views from several bedrooms, great room, as well as from a wrap around deck and terrace patio. A private covered dock with an open slip is ready for your boat. Enjoy s'mores at the large stone fire pit near the lake shore or at the stacked stone fireplace on the covered deck. 250 ft. of lake shore so you won't feel crowded. Large eating area in dining room for big families. (1) king, (1) queen, (2) full and (2) twin beds fit comfortably in 4 bedrooms. Other Amenities: Internet WiFi; Weber gas grill; horseshoe pit; covered boat dock; 80+ HD channels on (2) wide screen LCD/LED TVs; large paved driveway; (2) indoor stacked stone fireplaces; (1) stacked stone fireplace on covered deck; Paved road to house from highway and from downtown Blue Ridge; washer and dryer; professional grade kitchen appliances including Viking range; bar-sized refrigerator on lower level; granite kitchen island with seating for 4; 8 ft. dining table; two person kayak with paddles. Each bedroom has it's own bathroom. House has views of lake and mountains. Very close to town. All 4 showers have beautiful stonework on floors and walls. Soaking tub in master bath. One bar of soap is provided per shower. Hand soap is provided. One hair dryer in King room and another bathroom. Bring your own swim towels. Two dryers provided. One on each level of the home. 2 gas log burning fireplaces. One on each level. One wood burning on deck. Pods for dishwasher provided. Dish washing soap for sink provided. Viking range with 5 burners and oven. One roll of paper towels, dish soap, vacuum, crock pot, blender, garbage bags, some spices. One washer and dryer located in the pantry off of the kitchen. Pots & pans, storage containers, & everything you need for cooking. Dishes, utensils, glassware provided. Outdoor horseshoe pit with shoes is provided. Tandem (2 person) sit-on kayak available for use. Access to the deck from master bedroom and dining room. 4 adult size life vests available plus floats and noodles. SERVICE FEE IS A MANDATORY FEE CHARGED BY VRBO (not the owner). Pontoon boat, kayaks, canoes and paddle-boards are available for rent at the Marina, only 5 minutes from house. We all enjoyed our time at this beautiful home! It is beautifully maintained and decorated! Truly felt like home! It had everything we could ask for and more!!! You will not be disappointed if you stay here! We hope to return again! We had a great time. Beautiful views and the home is close to town. A great home for a family vacation. We had a great time in Blue Ridge and this home was half the reason. We thoroughly enjoyed our time to relax and recharge. The view was so refreshing each morning and downtown was a hop, skip, and jump away! The home has everything you would need. Thanks so much for sharing your home with our family!!! This is my 3rd or 4th stay at this INCREDIBLE home! The owners are very responsive and provide a wonderful home. They have thought of everything you could need for your stay in their lake home. This home is so comfortable and plenty of room for everyone. Can't wait to return next year! This home is well equipt with everything you would have at a luxury hotel. The view and proximity to the city are ideal. We will definitely be back! From the minute you see this house, your expectations have been more than met and exceeded! This is a gorgeous home with a fantastic view of Lake Blue Ridge! The craftsmanship of the house alone is outstanding and you could spend hours just appreciating and looking at the beautiful wood, architecture, and attention to details. The house is decorated beautifully - from the selection of furniture, to the bedding and artwork. The kitchen is a wonderful size and we cooked almost every meal while we were here, and the kitchen was well stocked with pots/pans/ dishware and spices. My husband's favorite spot was on the back covered patio by the fireplace. Even when it was cold outside, it was very comfortable by the fire with the warm provided blankets. My kids favorite place was the downstairs game room with an air hockey table, very comfortable couch, and of course - lots of games! My favorite spot was on the lake! The double kayak supplied by this home rental was such an added bonus. We were fortunate to have some very calm days in January and the lake is just beautiful - wonderful views of surrounding mountains! The town of Blue Ridge has a wonderful downtown with lots of shops and restaurants. We felt privacy at the lake and enjoyed being in nature, but it was also nice to be so close to downtown for groceries and shopping. It was such a treat and joy to bring in the New Year at this lovely place and make special family memories! I also want to mention that because of all the rain, the access to the dock was under water. The owner very promptly came out that same day to fix it - even in the rain! That responsiveness was so very appreciated!